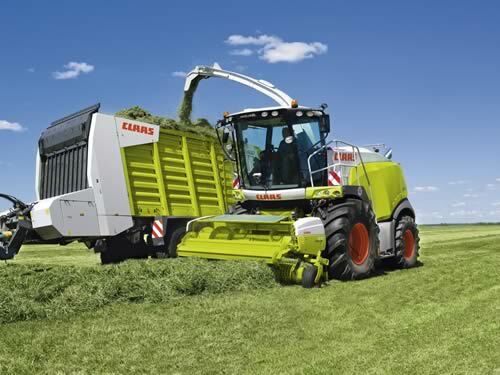 With a total of 11 models, CLAAS still provides the widest range of forage harvesters in the world. New developments in terms of operation, maintenance and efficiency now make the JAGUAR even more versatile and cost-effective than before. With its rounded design, the new JAGUAR 800 model series is similar to the shape of the 900 series – which means it too features a highly efficient air duct pipe for the cooling system and offers the driver good visibility. The large VISTA CAB comfort cab and CEBIS operating concept in the new JAGUAR 800 also help to increase visibility, as well as providing the driver with greater comfort – with all the EASY functions and driver assistance systems that was previously only available on the JAGUAR 900 series. Another new feature is that the JAGUAR 800 now has the option of being equipped with the MULTI CROP CRACKER and a mechanical accelerator gap adjustment system to optimise the crop flow. They also have a mechanical quick attachment coupler and hydraulic flat coupler for quickly and conveniently attaching front attachments. Both model series now have a uniform interface for front attachments as well. DYNAMIC POWER, the system for adapting engine output and fuel consumption to the particular operating conditions, is now also available for the JAGUAR 870 and 860. A new feature for the JAGUAR 900 model series is DYNAMIC COOLING, which uses a variable speed drive to automatically adjust the speed of the fan depending on the temperatures of the cooling water, the hydraulic oil and the charge air. Lower cooling efficiency allows power savings of up to 12 kW to be made, which can be turned into chopping power instead. CLAAS offers a new feature exclusively for the JAGUAR 980 in the form of CRUISE PILOT automatic speed control, which has previously only been used in LEXION models. CRUISE PILOT ensures that the forager is always used with the optimal engine load in thick and thin crops. The target engine speed can be preprogrammed in CEBIS and the driver can choose between three strategies: Cruise control (constant ground speed), output (constant throughput) and maximum engine load. The compression rollers in the JAGUAR 900 feature something else that's new: A pulling cylinder now draws the rear top roller with constant pressure onto the crop, which means that pre-compression is not dependent on the swath height. This ensures optimal pre-compression and therefore chop quality even in thin swathes. Thanks to the new COMFORT CUT infinite cutting length adjustment, there is now no need for a switch point on the feed drive on the JAGUAR 900. It is now possible to adjust the cutting length over the entire cutting length area. This increases output at the feed rake conveyor and gives users complete flexibility when choosing the cutting length depending on the dry matter. The steeper pitched rear axle on the running gear of the new JAGUAR 900 allows an even greater steering angle of up to 47° and a correspondingly lower steering radius of up to 12.5 m. Furthermore, even larger tyres of up to 2.05 m in diameter on the front axle and 1.65 m on the rear axle are now available for the 900 model series. The throughput quantity-dependent sharpening device further improves chop quality. The driver can now be reminded when the next routine for knife grinding and adjusting the shear bar is required according to time – providing that a QUANTIMETER is being used – or depending on throughput quantities. CEBIS offers additional configuration parameters for this. This means that when fitting used blades, for example, the remaining blade condition can be entered in CEBIS. A number of other improvements have been made to the CEBIS operating concept: In chopping mode, for example, the driver can use presettings to switch off some of the automatic functions at the start in order to control the machine manually. If the chopper eventually starts running over the long periods at full power again, all the automatic functions can be switched on again at the touch of a button. Furthermore, CEBIS now has a day/night mode and displays the rear camera view when reversing. Both JAGUAR model series can be fitted with a variety of engines. CLAAS offers different Mercedes-Benz engines for all models and these meet the exhaust after-treatment regulations in their respective countries of use, including Stage IIIA (Tier 3), Stage IIIB (Tier 4i) and Stage IV (Tier 4). CLAAS is using the latest six-cylinder series engines from Mercedes-Benz – OM 470, 471 and 473 – to achieve the exhaust gas purification level Stage IV (Tier 4). The exhaust gas from all engines is purified using an SCR catalytic converter (if installed). MAN V8 and V12 engines are now only used in the JAGUAR 970 and 980. Although the new engines are more economical, CLAAS is also fitting the new JAGUARS with even larger fuel tanks (up to 1500 l) in order to lengthen the time needed between refuelling. Another thing the JAGUAR 800 and 900 model series have in common is the new maintenance concept, which can save users a significant amount of time. To install and remove the CORN CRACKER, the designated side flap can also be swivelled 90° towards the rear. This makes access for installing and removing the unit, for example by fork lift truck, considerably easier. Even the accelerator can now be lifted out of the machine sideways in this way. The two new JAGUAR model series are responding to the increasing use of silage additives, especially with grass, with larger-volume 375-litre tanks that have a dosing capacity of up to 400 l/h or 2 l/t. The ORBIS maize header now has a new three-way input gearbox for adapting to different crop conditions. The DIRECT DISC direct cutting unit can now be switched on in two stages thanks to an additional clutch. This minimises starting torque and allows it to be switched on at full load. The JAGUAR 800 and 900 will be available from January 2014.